Being a foremost organization in the industry, we are actively engaged in manufacturing the best quality range of STENLESS STEEL Tower Bolt. we started our journey as PADMAVATI AGENCY, dariyapur ,Ahmedabad in 1997 with passion and futurative vision. it was started with the trading of hardware and tools of few brands. we launch our brand "CIRCLE" IN 2007. with the co-opertaion of our customer and their trust in provided services brought it to a full fledge leading to the foundation of circle industries. 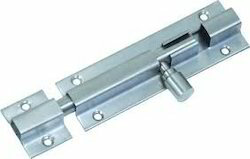 we “CIRCLE INDUSTRIES” are a Sole Proprietorship firm that is recognized name occupied for manufacturing, exporting and supplying a wide range of DOOR KIT, Stainless Steel Aldrops, Stainless Steel Tadi, Stainless Steel Door Handles, Stainless Steel Tower Bolt, Stainless Steel Latches, etc .. Our robust and innovative infrastructural base comprises various sub-functional units such as Procurement unit, Production unit, Quality Testing unit, Research & Development unit, Warehousing & Packaging unit, Transport & Logistics unit, Sales & Marketing unit, etc. All these alienated sub-units are manned by our adroit and skilled professionals, who hold rich industrial experience and knowledge in their respective filed. This infrastructural unit is installed with innovative machines, tools and equipment to enhance the productivity. Owing to our ethical business polices and flexible payment modes, we have attain a commendable position in the market. Our offered products are manufactured with high precision by utilizing quality tested components and advanced technology under the stern surveillance of our dexterous professionals. The best quality raw materials are used in the manufacturing process are procured from the dependable and prestigious vendors of the market. Our offered products are widely applauded for their salient features like rigid design, scratch resistance, high durability, perfect finish, precise dimensions, high strength and easy installation. We also facilitate our honorable patrons with customization facility on offered range of products at rock bottom prices. In addition to this, the provided products are checked by our team of quality analysts against different measures to assure their flawlessness. Under the optimistic direction of our proprietor, “Mr. Sunilkumar Jain” (Proprietor), we have been able to gain invincible and commendable position in the market.